Say Anything is a light-hearted game about what you and your friends think. It gives you the chance to settle questions that have been hotly debated for centuries. For instance, "What is the most overrated band of all time?" or "Which celebrity would be the most fun to hang out with for a day?" So dig deep into your heart or just come up with something witty - this is your chance to Say Anything! We have all played Apples to Apples and most of us have utterly despised every second of it. This game is a little similar, but way, way better. A starting person draws a card and on the card is a number of different questions. You pick one of the questions on the card and ask the rest of the group the question. Instead of selecting from a number of cards in their hand the other players write their answer on a reasonably sized dry erase board. Once all the answer are presented the person asking the question uses the “Select – O – Matic 5000” and decides which answer they like best. Then the other players vote on what they think the selector voted for with two token chips they have. Points are awarded for having your answer selected, placing your token on the right answer, and to the selector for every token on the answer they selected, up to three points per person per round. “What is the best part of being a guy?” …. Standing up to pee! “What’s the worst thing to say to a cop after getting pulled over?” …. Did you see how fast I was going?!?! “What can you say to your dog that you should not say to your spouse?” …. Fetch me my slippers!!! So as you can see there are a lot of possibilities with this game, and with the right group of party goers it is easily a hit. My wife and I have used it when having other couples over just to hang out and it is great when we are celebrating birthdays with the family. As a Party Game I would give it a nine or ten, but on the big scale of things I would prefer to play something with more depth. That is where I came up with my grade of 7 for this game. But if you are looking for a great party game to mix into your collection Say Anything is another party game hit by North Star Games, who also made Wits and Wagers. Every player receives their own color-coded white board to submit their best guess as to what the judge thinks the answer should be. They also receive color-coded gambling tokens. Unlike Apples to Apples, Say Anything is not just about putting forward your best answer but trying to figure out which answer the judge will pick. 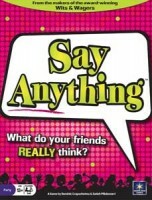 Say Anything is a great getting-to-know-you game to start up gaming parties with new friends. It can be fairly hilarious depending on the sense of humor of all involved, and is a gaming standard at my family gatherings. This makes a wonderful party game that gets funnier with fewer inhibitions (i.e. more drinks!). This game would easily suit large groups and requires very little explanation. It’s one of those games that is easier to just start playing than to explain. Score keeping is very simple and user friendly. Easy to add new players by just starting a new game, no real need to play to the 10 points required. Overall I’d say this a fun go-to game for non-gamers when everyone is tired of apples-to-apples. Can be very funny and conversations started. Works well in large groups. Even if your answers are not the best you can still win by voting correctly. If you or your group is unimaginative it can get repetitive and boring very quickly. The “recommended age limit’ depends on who is playing! Seems like the markers will run out quickly. This will be a party staple. I went to Gen Con a couple of years ago and did the Cheese Weasel tour of the exhibit hall. I grudgingly went to the North Star Games booth only to get my stamp. I was used to games with books for rules, tons of tiny pieces, and some sort of exotic Sci-Fi or Fantasy setting. As I sat down to play this I knew this was a game not for me, but… I needed the stamp! After a few minutes I was very surprised. This game is easy to learn and very fun. …an absolute breath of fresh air. I was so impressed that I actually bought a copy of this and some of their other games. So many times I have taken a game over to a friends house only to spend 2 hours learning/teaching the game. This is a game you could bring to a friend’s house and be ready to play in less than 5 minutes. Looking for something fun and light… buy this game. Add a Review for "Say Anything"